Projects - 41 chevrolet coupe inspiration. | Page 12 | The H.A.M.B. Projects 41 chevrolet coupe inspiration. Discussion in 'Traditional Customs' started by Lono, Mar 14, 2018. Much better. Now I'll rework the first one. Enough running board for a gangster with small feet. Not a lot of butter but some coming this week. guthriesmith and Scooterville like this. Steady it is...................slow, not so much! Lono and DIYGUY like this. Hmmmm yep I like em. On to side 2. Fern 54, soddruntlestuntle and slv63 like this. I like the look with skirts. I’m putting mine back on. Onto the passenger side and Beek today. Then it' long block the high build primer. Contemplating the rear panel, if I should weld in a new segment ( no rear pan available) or tighten up the space between body and bumper. Might even get rid of that chrome pimple on the rear fender. Found a temporary colour (sorry, I'm really tired of flat black) I'll shoot for this summer then after the chop, it' forever colour. The welded fenders look great. will you be rounding the rear hood corner? I'm glad you're not in a hurry to chop. It's plenty nice in the meantime. Here's a thought...You've already chopped tops. How about pulling off a body section, before calling it quits? 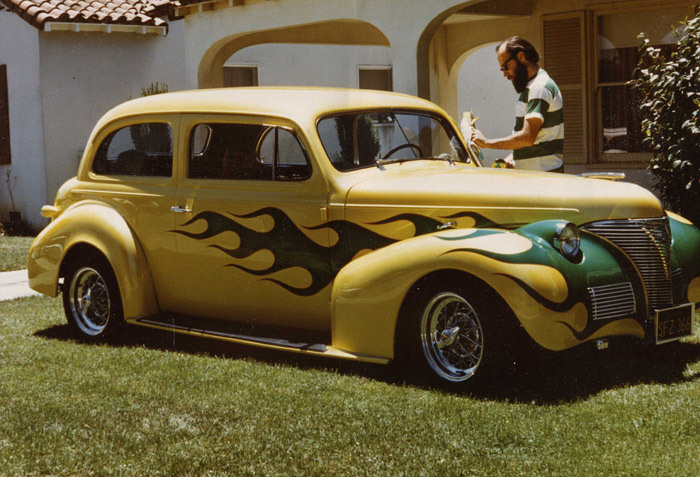 Rod Powell did this un-chopped '39, and the proportion's are killer. This channeled '40, albeit chopped, gives some idea (although I feel the rear fenders should be raised). I'll go fishing in the Photoshop pool, and come back if I catch anything. Peanut 1959, Lono and Jiminy like this. That coupe is out of sight. Pretty radical custom in it's day, chopped, sectioned Plymouth bumper... crazy car! Thanks, I'm loving the smooth lines too. The chop will happen over winter and will be a sloper style when done. I have something else planned for the roof I'll show off when it gets underway. I'm going to start the rear pan extension tomorrow. I'll bring up the bumper snug and the licence plate will hang below and behind the bumper in the center. Sancho did this sweet Photoshop...Close to the bone! Round the hood corner, and go for it! soddruntlestuntle and Lono like this. I'm still running factory springs with all but 2.5 leafs removed. Sweet but one real big drawback...its out of my skill set and I don't have anyone close to help out. Great Photoshop work! You make everything 'look' so quick and easy (and good!). I have absolutely no doubt in your capability of pulling this off. What s cool car that turned into. A 2 seater. Can you imagine the weeks, months it would have taken. I would have given up and moved onto a different project long before it got that far. Uribe, Scooterville and guthriesmith like this. No English wheel in my shop so to make a roll pan that follows the body rather than being ugly flat.. lots of slices and tack welding. There's a vacant lot next door to me. Let me know if you decide to re-locate! Skim coat of butter and sitting overnight. Tomorrow the gas filler gets moved and welded up. After that, the roof gets sanded and she'll get shot in lacquer to keep till next summer. I'll miss the fathers day show I wanted to get to but a big one on July 21 is a go. A breath, attention to the honey do list and a sanding next. Then next week it' lay on some temporary lacquer. The chrome zit is gone now. Wonder how I'll gas it up Now? Fern 54, Surfcityrocker, Sancho and 1 other person like this. I might just cut in the jams and grill surround today. Boy, removing that does wonders for the aesthetics of the rear end. Yea! Fender pimple gone! I knew you'd come to your senses. Temporary paint coming July long weekend. Fern 54, Peanut 1959 and 'Mo like this. I took a few liberties with the Photoshop that Moose did. soddruntlestuntle, Fern 54, Sparked and 2 others like this. That's awesome Madfish! Snap... and make it so! Tomorrow it's polish windows and trim with steel wool, paint the window rubber and start blowing in the door and trunk jams. I use brass wool for windows. Come out brand new if just old and trim also comes out great.